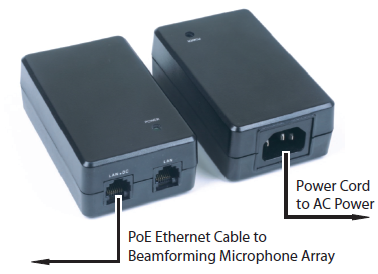 The PoE Power Supply & Cables Kit is available for the Clear One Beamforming Conference Room Microphone Array. Supply the power for your Beamforming Microphone Array through its Power-Over-Ethernet (PoE) connection included in this kit. NOTE: The PoE connection is only for power, not control. Power must be for individual units; no daisy-chain power is allowed.